It sounds like an infomercial, but ABB is bringing renewables onto the grid with more efficient transmission. Sometimes press releases sound like internet pop-up ads or late-night infomercials. That's certainly the case with a few announcements from ABB in regards to its work across the globe installing transmission lines. The power and automation technology giant is offering more results quicker, finishing projects ahead of schedule and offering more bang with every mile. ABB announced that it has won a $700 million order to provide an 800-megawatt high voltage direct current transmission line for the German transmission grid operator transpower. The technology will connect more offshore wind farms in the DolWin1 cluster in the North Sea to mainland Germany. The project will use HVDC Light technology to move 400 MW of power to an offshore HVDC converter, which then shuttles the energy onshore via underwater and underground cables. In a statement, ABB said the 320-kilovolt technologies will be the highest voltage level ever used for HVDC Light. The project comes just as the European Wind Energy Association announced that 333 MW of offshore wind was added to the grid in the first half of 2010, with another 151 turbines that can provide 440 MW of power ready to be connected to the grid. The ABB transmission lines to connect DolWin1cluster are expected to be in operation in 2013. In the U.S., offshore wind is still just a glimmer in the investor's eye; there are 12 proposed projects off the East Coast and in Lake Erie and the Gulf of Mexico. ABB isn't just linking up wind with its HVDC Light cables. It also announced today that the world's first ultra high voltage direct current, or UHVDC, went into commercial operation as part of the Xiangjiaba-Shanghai project in China one year ahead of schedule. The connection will deliver power for 31 million people. 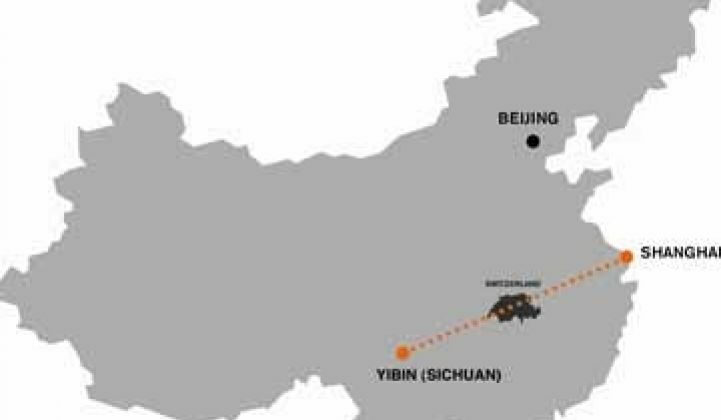 The link will move up to 7,200 MW of power from the Xiangjiaba hydropower plant in southwest China to Shanghai, about 2,000 kilometers (1243 miles) away, the longest transmission line to date, according to ABB (until a planned 2,500-km line is completed in Brazil, that is). Forget about the kilovolt capacity promised with HVDC Light -- this technology also sets a new standard in terms of voltage levels by delivering 800 kilovolts (that's about 200 kV more than the Itaipu transmission line in Brazil), which will allow for fewer transmission losses. ABB estimates the energy saved will match the power needs of one million people in China. Unlike HVDC Light, which runs underground and undersea, the cable in China will run as a single overhead power line. Although there aren't nearly as many exclamation points in stories about transmission lines in the U.S., one FERC commissioner has noted that updating the transmission grid is one of the trends to watch. It will have to be if more wind is going to be brought on line. A report from the American Wind Energy Association, an industry trade group, published earlier this year found that there were 300,000 MW of proposed wind projects that could potentially be added to the U.S. grid, it if wasn't for outdated or insufficient transmission. Now that's enough energy to warrant an exclamation point.